JEREMY WADE has been explaining all about the ninth and final series of ITV’s River Monsters – set to return to our screens early this new year. On a volcanic island in the Pacific Ring of Fire, an ancient fishing community is being terrorized by something in the water thatÕs left behind a trail of bloodied victims. With a collective knowledge built up over centuries, these fishermen thought they knew everything in these waters, until now. The only clue they have to the attackerÕs identity are the large puncture wounds itÕs left behind. Now angling detective Jeremy Wade journeys to this land of fire and folklore to put himself to the ultimate test; can he uncover the identity of this mysterious fanged assailant? 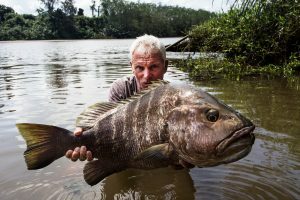 RIVER MONSTERS star Jeremy Wade is getting wet for the new and penultimate eighth series on ITV – as all the six episodes are filmed in the sea. 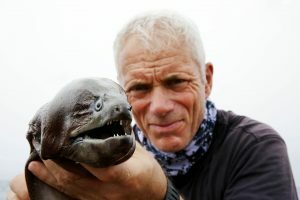 Turning his attention from freshwater mysteries to the worldÕs oceans, aquatic detective Jeremy Wade goes in search of the real creature behind the enduring sea serpent legend. Starting in his own backyard Jeremy fishes in the English Channel on the trail of a violent attack. His investigation then leads him to Thailand where the mythology of the sea serpent reveals a vital clue, before travelling to the unlikely location of France where he attempts to finally solve the mystery and have a sea serpent encounter of his own. Has the monster finally been unmasked? 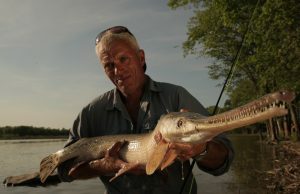 JEREMY WADE’S mega popular TV series, River Monsters, is ending.